One summer a long time ago, the seven sacred council fires of the Lakota Sioux came together and camped. The sun was strong, and the people were starving for there was no game. Two young men went out to hunt. Along the way, the two men met a beautiful young woman dressed in white; she floated as she walked. One man had bad desires for the woman and tried to touch her. But, as he did this, the man was consumed by a huge cloud and turned into a pile of bones. The woman spoke to the second young man and told him, "Return to your people, and tell them I am coming." This holy - wakan - woman brought a wrapped bundle to the people. She unwrapped the bundle, giving the people a sacred pipe and teaching them how to use it for prayer. "With this holy pipe, you will walk like a living prayer," she said. The woman told the Lakota about the value of the buffalo, the women and the children. "You are from Mother Earth," she told the women. "What you are doing is as great as the warriors do." Before she left, she told the people she would return. As she walked away, she rolled over four times. 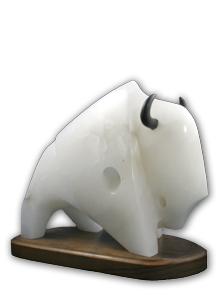 Then, she turned into a white female buffalo calf; hence the name White Buffalo Woman or White Buffalo Calf Woman. It is said, after this important day, the Lakota honored their pipe, and buffalo were plentiful (from John Lame Deer's telling in 1967). Many believe the birth of the buffalo calf Miracle in the United States on August 20, 1994 symbolizes the coming together of humanity into a oneness of heart, mind and spirit.